A couple of weeks ago, we kicked off a new project called Data Discovery. The aim is to add some new features to the ONS (Office for National Statistics) website. We mentioned this as part of our roadmap post a few weeks ago, and it’s a major area of focus for us in the coming months. After a formal tendering process (read: filling in lots of forms) we have enlisted a team from Equal Experts to join our existing gang. We cleared everyone’s schedules and have spent the last 2 weeks working through an ‘Inception’ process. We took this and added a sprinkle of the Google Ventures’ design sprint process to give us a short, but intense period of preparation. We’re aware that it is often tempting to pile-in at the start of a project and build something, anything. After all, working software is the best measure of progress right? But does everyone on the team understand the problem we are trying to solve? Have we agreed how we are going to work? And do we have an appreciation of where our biggest design, technical and business challenges may lie? In week one, we focused on developing a shared understanding of the project, and how we’d work together. Andy, our Service Manager, gave us his vision for the project. Together the team discussed the initial goals, reviewed the technical landscape and looked back over the user research that had been done in discovery. There was some great work done in discovery around identifying the main user groups and turning these into personas. 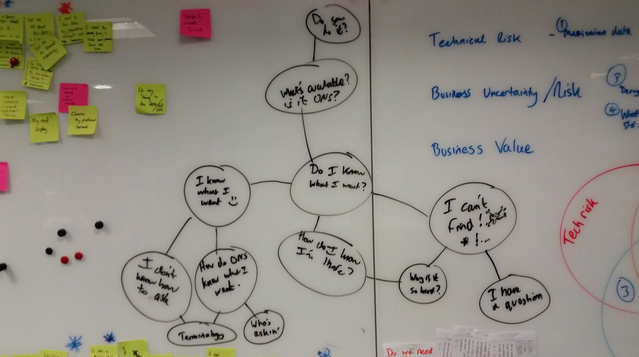 Using these as a starting point, we mapped out the ideal journeys for our main user groups. We identified that the biggest risks were surrounding a group of users called “information foragers”. These people use the ONS website for work, but they aren’t experts in statistics. Their journeys are typically complex, and we felt that solving this would indirectly help our other users too. We ran a “how might we” session to identify ways in which we might solve the needs of these users. In a couple of days we had started to produce a number of prototypes and experiments that explored ways to improve the navigation, search and data encryption aspects of the project. I think it’s fair to say that at the end of week one the team had a real sense of purpose. It also increased our knowledge of the project as a whole. The next steps are to finish creating our backlog, continue working on our prototypes, and to plan some more user research.